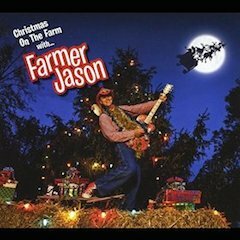 This much is guaranteed: you’ll find no other Christmas album for this season as warm-hearted, warm and downright funny as Jason Ringenberg’s (aka Farmer Jason) Christmas on the Farm. Being nothing less than a holiday lesson for kids in the important role animals of all kinds play in everyday life and did play in the Christmas Story, Christmas On the Farm embraces Farmer Jason’s past as neo-honky tonk punk rocker (as the titular head of Nashville’s awesome Jason & The Scorchers) to advance its messages with a twang here, a backwoods country drawl of a vocal there and with what the Pogues’ late, great Philip Chevron called “a punk rock kick in the arse.” To accomplish this Farmer Jason—the rural personal Ringenberg adopted a decade or so ago—enlisted the formidable assistance of producers Thomas Jutz and Peter Cooper, and further enlisted Jutz to do something else he excels at—playing rootsy, dynamic guitar—added Mark Fain on bass and Lynn Williams on percussion and got some other expert assistance from the likes of Sierra Hull (mandolin), Steve Herman (trumpet), Fats Kaplin (steel guitar and fiddle), Kelli Workman (piano), Dave Roe and Molly Felder (vocals), a memorable guest appearance by Webb Wilder, and even a couple of other Ringenbergs—his daughters Addie Rose on vocal and Camille on flute joining in to create a charming, lilting rendition of “Away In a Manger” that evokes the solemnity and tenderness of the Christ child’s birth night with the animals lowing beside Him protectively. Farmer Jason makes his IndieGoGo pitch to raise funds for his Christmas On the Farm With… album, playing excerpts of new songs and explaining the concept. “Away in a Manger” illustrates the Farmer’s approach to this project, in which kids come first—he introduces the song by explaining how “farmers and farming were a very important part of the Christmas Story” in that “the first people to see the baby Jesus were sheep farmers… More importantly, Jesus was born in a stable, which is a small horse or donkey barn, near Bethlehem, Israel.” Far from being put off, the guess here is that most adults will find these interludes appealing simply owing to Jason’s enthusiasm and sincerity—you’d have to be a real Grinch to grouse about the narration, much as you’d have to be one to dis the music herein. Though the album is mostly traditional or contemporary carols and songs, the lead number is Ringenberg’s own bouncy original, “Christmas On the Farm,” which bears a passing resemblance to “She’ll Be Comin’ ‘Round the Mountain” and soars on the strength of ebullient solos by Justin Moses on banjo and fiddle and a clarion call of trumpet by Steve Herman as Jason’s vocal extols the wondrous natural beauty of rural life at Yuletide (interesting how this track sounds much like a Giving Tree Band song), including “a guitar pickin’ chicken pickin’ out a song.” Another Ringenberg original, the thumping “Santa Drove a Big John Deere,” offers a different twist on Santa’s Christmas Eve chores by imagining no force of nature being too daunting for Kris Kringle behind a big John Deere tractor, romping through the spirited performance with an assist from the deep, resonant twang of Jutz’s guitar. Folks, it only gets more inspired from there. If you’ve always wondered what “Up On the Housetop” would sound like in a variation of the Johnny Cash beat, well, third song in supplies the answer. Jutz provides the necessary Luther Perkins homage with his upper strings Tele soloing as rhythm section Fain and Williams keep the “boom-chicka-boom” bottom solid. Chalk this one up as the best “Up On the Housetop” since the Jackson 5 rocked through it on their 1970 Christmas album. A seasonal retooling of an older Ringenberg-Peter Cooper original, “Punk Rock Skunk,” now titled “All I Want for Christmas Is a Punk Rock Skunk,” is even zanier—a “punk rock kick in the arse” with hints of the Cash beat and “Ring of Fire” trumpets and lyrics suggesting possibly viable alternatives to the titular animal, such as “a piggy singing pop” (“Someone make it stop!” Farmer Jason shouts), “a jaybird singing jazz” (“a skunk has more pizzazz!”), “a country singing croc” (“no, the skunk can really rock!”) and so on; finally you begin to pick up on these alliterative allusions bearing some rhythmical resemblance to a beloved passage in Arlen-Harbug’s “If I Were King of the Forest” as performed by Burt Lahr in The Wizard of Oz. After introducing “Hark! The Herald Angels Sing” as one of his family’s favorite sing-a-longs, Jason, Molly Felder and Dave Roe join voices as Kelli Workman accompanies them on an acoustic piano that sounds like it was recorded in a real country church with no acoustical treatment—you half expect to hear the sound of cars passing by on the road outside, so raw are the sonics here. The vocals, too, are raw—in tune and reverent but raw, again like you might find in a country church full of untrained but committed singers. This lack of affectation is part of the album’s undeniable charm, not least of it being the speaking, and sometimes singing, voice of Ringenberg himself. Every aspect of it—timbre, drawl, phrasing, enthusiasm—sounds for all the world, to your faithful friend and narrator, like none other than that of actor Tom Lester, best known to the general populace as Eb Dawson, the well-intentioned but often bumbling farmhand employed by Oliver Wendell and Lisa Douglas on Green Acres and whom he always referred to as “Mom” and “Dad” (over Oliver’s objections). As the album moves along the focus rarely strays from the animals, in the abovementioned “Away In the Manger,” in a humorous skit with Webb Wilder that sets up their trading swinging verses of “Rudolph the Red-Nosed Reinder” (in which Webb, when asked, offers unvarnished assessments of Santa’s reindeer, describing, for instance, Dasher and Dancer as being, respectively, “a speed demon and a hoofer) and in a showcase number, Ringenberg’s original “The Animals Song,” a furious punk rock workout, with a taste of Brian Setzer’s intro to “Summertime Blues” in Jutz’s heavy twanging riffs, celebrating how the animals rejoiced in Christ’s birth (“The animals they all did sing/it was the world’s first caroling/they sang together full of grace/when the light shown on their face” is the chorus) and insinuating into the story a smidgen of spirituality (e.g., “…sang together full of grace…” and “..the barn became a holy place…”) to keep the balance right. As it happens, only food takes a beating on Farmer Jason’s debut Christmas outing, as both the rousing, horn-driven stomp of “Eat Your Fruitcake” (“…and set your landfill free…”) and the album closing “We Wish You a Merry Christmas” (wherein Jason fends off all attempts to feed him a Figgy pudding, protesting, over the tune as sung by an a cappella trio comprised of Webb Wilder, Peter Cooper and Kristi Rose, “I…I really don’t want any figgy pudding…I don’t like that pudding…I really wish you would quit singing about this figgy pudding…”). Well, eventually they persuade him to take a bite and voila! 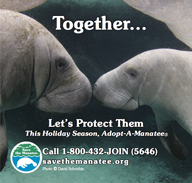 A Christmas miracle! He decides he likes figgy pudding—“I wish I would have tried it years ago now,” an abashed Farmer Jason admits, thus bringing dignity to the dish he had been so thoroughly bashing—and joins in a merry closing chorus of “We Wish You a Merry Christmas” to close the festivities on a cheerful note. It’s not easy to do a really different Christmas album without it seeming cynical and/or smug, but Farmer Jason has accomplished the neat feat of finding a new way into the Yuletide in a joyful, winning way that honors the traditions, works some interesting contemporary musical twists on the old songs and introduces some new original songs deserving of perennial status from here on. 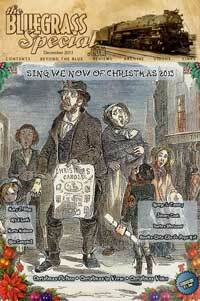 Think of the character Farmer Jason as a modern-day version of Dickens’s Mr. Fezziwig in “A Christmas Carol”: kind, generous, of sunny disposition and valuing above all else friendship and esprit de corps, making everyone seem part of what makes him happiest in his life and taking something positive from their proximity to him. Thus the real Christmas miracle emerging from this disarming long-player.